Are you preparing for a brief trip to the gambling capital of the world? Do you want to make it unforgettable and have a trip to end all trips? Well, then you should contemplate visiting a number of gambling floors and taking pleasure in different casino games. Among all of them, Las Vegas makes roulette stand out from the crowd because it exudes luxury that befits the venue. The popularity of this game is evidenced by its appearance in many Hollywood movies. Have you watched that famous scene in “Casablanca” where Rick enters a small casino joint only to ask the guy who seems to be losing everything, “Have you tried 22 tonight?” Well, he didn’t, but the course of the evening took a turn for the better after he put his remaining chips on this number. Admittedly, the chances of this character, played by the great Humphrey Bogart, helping you in an opulent Las Vegas casino are slim to none. But what you can do is rely on your hunch and hope for the best. In this article, we’ll show you how to play roulette in Vegas. Also, if you’re on a tight budget, we have you covered — we’ll mention the cheapest roulette tables in Vegas as well. Firstly, the European variant is also known as the Single Zero Roulette. The wheel has 37 pockets on it — each one of them represents numbers from 1 to 36, whereas one spot is dedicated to, you guessed it, one zero. Mind you, this number is crucial as it works in favor of the house. In other words, all even-money bets (e.g., red-black) go to the house if the ball lands on it. Regardless of this rule, it boasts a house edge that makes other games pale in comparison. The rate of 2.7% encourages many passionate gamblers to play it. You can find the best roulette in Vegas as well — you just need to visit the luxury resorts Encore and MGM. 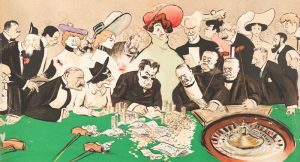 You might be ecstatic to know that some of them grant the minimum bet of $10, but we’ll mention some of the cheapest roulette tables in Vegas further down the article. At times, it even includes the “La Partage” rule which further decreases the house advantage to 1.35%. To be specific, you’ll get half of your money back if the ball lands on the green spot (i.e., 0) — the only requirement is for you to place the even-money bet, and you might increase your odds of winning. Moving on to the American variant which goes by the name of the Double Zero Roulette. The layout differs a bit in that, instead of one, the roulette wheel has two zeroes (i.e., 0 and 00) which accounts for the 38th pocket. Logically, this means that the casino’s chances actually increase because they’ll have two additional spots that might help them win. So, the house edge is 5.26%. This is what makes the American Roulette less favored among the player base. Unlike the rare European variant, you’ll find this one in almost every casino across the Sin City. It’s only natural that they include it instead of the first one. After all, they are running a gambling venue and have to come up with ways in which they can generate profit — this variant helps them in this mission. But don’t worry — we’re not done with our lesson on how to play roulette in Vegas yet. After all, this wouldn’t be the entertainment and gambling capital of the world if it didn’t incorporate some one-of-a-kind versions of this game. We’re referring to the Triple Zero Roulette — a less known type which you can’t find in your run-of-the-mill online casinos. Venetian introduced it back in 2016. As its name suggests, it features three zeroes on the wheel. The rules don’t differ from the ones used in the other two. But you might be wondering about its house edge. Well, you won’t be thrilled to find out that it’s 7.69% — this certainly isn’t the best roulette in Vegas. No wonder that they’ve decided to include it! Venetian features two tables for this variant. As with the European version, you can wager as little as $10. In all honesty, everyone’s still waiting for this type to gain momentum. Yes, even the affluent Las Vegas can be a source of entertainment for those who can’t afford to spend too much. Therefore, if you wish to gamble but still not place huge bets, then we’ll mention where you can find the cheapest roulette tables in Vegas. Some frequent visitors to this city recommend the Circus Circus Resort and Casino to the low-rollers. Here, they can enjoy their favorite pastime and place the minimum bet of $5. Apart from this one, Excalibur and Luxor also allow you to make this wager. The latter seems to increase the bet as the night goes on. Some gamblers report that they wagered $5 at 7 pm, but that those joining the game after 8 pm had to pay $10. On the bright side, at least they didn’t change the minimum wager for those who came first. Lastly, we’re happy to say that $5 isn’t the only minimum amount in Las Vegas roulette. You can even come across certain gambling venues that allow you to put $1 or $2 on your selected number or section. As a case in point, we’ll mention El Cortez. If you’re a novice player, here you can learn how to play roulette in Vegas first-hand. What’s better than grasping the rules on the casino floor? Get Ready for Your Visit! As you now know where to find the best roulette in Vegas (i.e., the European variant), this will elevate your experience. So, all we can do is wish you good luck and hope you’ll guess the right outcome!